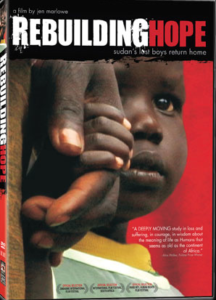 New York- My friend Jen Marlowe heads a grass roots development project in South Sudan called Rebuilding Hope that seeks to bring education, health care, and wells for clean, safe drinking water to remote villages in the region. Jen also had a post on the Huffington Post last week entitled “South Sudan: Progress and Pessimism” which details both change brought by the relative calm of the North-South Comprehensive Peace Agreement which has just passed the five year mark, and fear on the horizon in regard to the upcoming elections in April and the 2011 referendum that could lead to southern secession and further instability. Jen’s film Rebuilding Hope: Sudan’s Lost Boys Return Home can be bought from Cinema Libre Studios for $19.95 plus $5 shipping. Order your copy.